Why not? Well, I submit it is because Christians in the South, both black and white, love each other and they love Jesus. They are wise enough to not react to outside agitators and not burn their own town. And, to a certain extent, Blacks in the South, still know their place. But, there has been major progress in the South. Dr M L King said “the South will solve its race problem long before the North.” In the South Blacks and white have lived next to each other forever, and most white babies were suckled by Black nurse maids. And Sunday morning is no longer the most segregated time of the week. It is inspiring and encouraging to see the mutual respect that white and Black Christians show each other. The memorial service at Emmanuel AME was beautiful to watch. Black and white Christians singing and praying together. God is love. His truth is ever lasting and His mercy endures forever. Bravo Charleston. You have shown the world that Love is stronger than hate; Black and white Christians can live together in peace. People are praying for racial accord in a city that built its initial fortunes on slavery and has been shaped in part by racial tension and violence since its founding in 1670. CHARLESTON, S.C.— Community leaders and parishioners across this historic city vowed on Sunday to build racial accord in the wake of last week’s killings of nine black members of an African-American church, allegedly by a white man. But as church bells rang and black and white parishioners prayed together at Emanuel African Methodist Episcopal Church, the site of the attack, and at other houses of worship, signs of how challenging that will be were apparent. 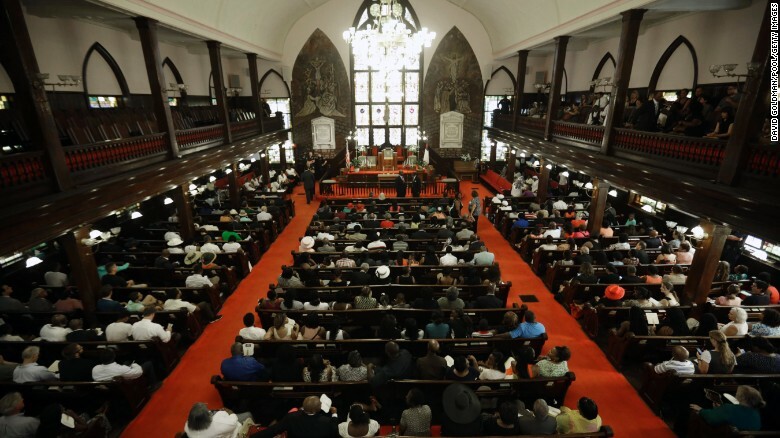 At Emanuel AME, a rapturous and racially diverse crowd packed the church, dancing, singing hymns and shaking tambourines to show that the killings could not shake the resolve or faith of one of the oldest black churches in the nation. Churchgoers lined the walls and crowded the balcony in bow ties and three-piece suits. Hundreds of people stood in the streets, near speakers, to listen to the service. Numerous police officers guarded the proceedings, and teams of grief counselors were on hand. “A lot of people expected us to do something strange and break out into a riot,” the Rev. Norvel Goff said from the pulpit. “Well, they just don’t know us. They don’t know us because we are a people of faith.” He praised the city for responding with love and compassion. Charleston built its initial fortunes on slavery and has been shaped in part by racial tension and violence since its founding in 1670. The first shots of the Civil War were fired here, and much of its robust tourist industry plays to notions of a genteel antebellum South, a gentility that was propped up by the institution of slavery. Over the past few decades the city has changed dramatically, with major companies relocating to the region and upscale shops and vogue restaurants dotting the downtown. Large banners appeared on some buildings after the shootings, urging racial harmony. An interracial rally was planned for Sunday evening across the Arthur Ravenel Jr. Bridge, a dramatic span that dominates the city skyline. Yet outer neighborhoods and nearby communities are impoverished, and many say racial tensions fueled by economic disparities and other issues linger beneath the surface. 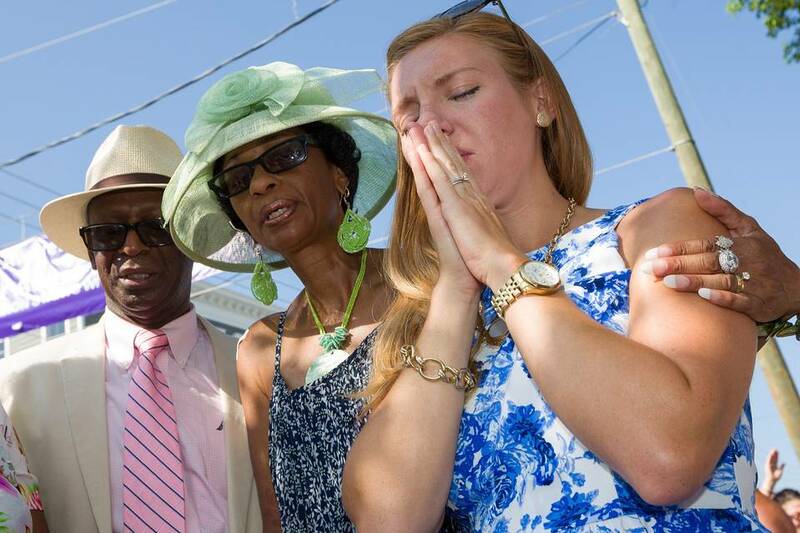 As congregants left the church, a large, mostly white crowd greeted them by singing the song “Amazing Grace,” a show of support that brought tears to many peoples’ eyes as they stepped into the hot South Carolina sun. A little more than a mile away, about 150 parishioners, almost all of them white, gathered for Holy Communion at St. Michael’s Episcopal Church, one of the oldest parishes in the city. Both George Washington and Robert E. Lee once prayed at this ornate church, built in the 1700s, and Charles Pinckney, a signer of the Constitution and a prominent slave-owner, is buried in the adjacent graveyard. Alfred T.K. Zadig Jr., the 47- year-old rector of St. Michael’s, said he was having dinner only a block away from Emanuel when the shooting took place Wednesday night, and the tragedy made him realize how little connection he had to the city’s black churches. “I did not know one single person in that church,” said. Mr. Zadig, who has been St. Michael’s rector for eight years. The church now is committing itself to building a relationship with Charleston’s black churches, including contributing money to help Emanuel and inviting members of Emanuel to preach at St. Michael’s, the pastor said. 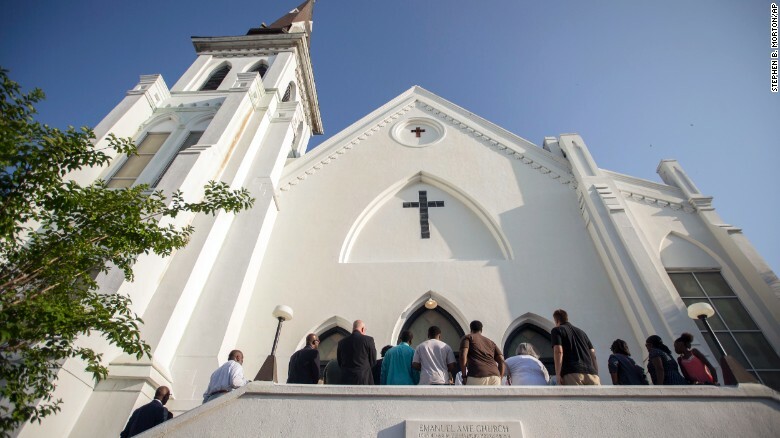 The nine people who were killed in a mass shooting at Emanuel African Methodist Episcopal Church in Charleston, S.C., on Wednesday have been identified by the authorities. The group of six women and three men had come together for a weekly Bible study meeting. The man who is suspected of killing them is now in police custody. (1) The Rev. Clementa Pinckney, 41: A state senator and the senior pastor of Emanuel, he was married to Jennifer Benjamin and the father of two children, Eliana and Malana. He was a 1995 graduate of Allen University and got his master’s degree at the University of South Carolina in 1999. He served in the state Legislature starting in 2000; The Post and Courier says black fabric was draped over Pinckney’s Senate chamber seat on Thursday. I believe Senator Clementa Pinckney was the real target of the assassin. The other eight were collateral damage designed to coverup a political assassination. Four years later, voters elevated him to the state Senate. Pinckney became even more influential through his work as a legislator, pushing several causes — like recently advocating for legislation to make police wear body cameras, believing it would protect lives, according to his cousin, state Sen. Kent Williams. According to local media reports from the time, Rev Pinckney attended a vigil in North Charleston in the aftermath of the shooting of Walter Scott, an unarmed Black man by a white police officer. Walter Scott’s fatal shooting by Officer Michael Slager was captured on camera by an eyewitness, and Rev Pinckney emphasized the significance of that video to the public’s perception of the case. Slager has been indicted for murder in the shooting and is awaiting trial. Rev Pinckney led calls for mandatory police body cameras, and rallied the public to show their support. “I think that if my colleagues will be moved by the fact that other people are moved by the need for body cameras, and also that there will be persons that will give testimony as to why body cameras are important,” he said. Following the shooting of Walter Scott by a North Charleston police officer in April, South Carolina state Senator Clementa Pinckney stepped up on the Senate floor to speak in support of legislation that called for the establishment and implementation of guidelines for the use of body cameras by the state’s law enforcement officers. Pinckney, the pastor at Emanuel African Methodist Episcopal Church in Charleston, was one of nine people killed in a shooting at the church on Wednesday night. “Today, the nation looks at South Carolina and is looking at us to see if we will rise to be the body and to be the state that we really say that we are,” Pinckney said in April, adding that Scott’s death had created a “yearning for justice” across the country. Scott’s fatal shooting by Officer Michael Slager was captured on camera by an eyewitness, and Pinckney emphasized the significance of that video to the public’s perception of the case. Slager has been indicted for murder in the shooting and is awaiting trial. Pinckney compared those who would be skeptical of allegations that an officer shot an unarmed man in the back multiple times to Jesus’ apostle Thomas, who is described in the Bible as refusing to believe that Jesus had risen from the dead until he could see and feel Jesus’ wounds himself. The legislation, which gained bipartisan support, passed and was signed by the governor on June 10. “I think that speech is what made the difference in that bill passing,” said state Senator Kevin Johnson. Johnson, one of the legislation’s sponsors, said Pinckney delivered “almost a little sermon” that swayed some people who were on the fence about the bill and silenced some of its critics. “That’s just what Clem was good at,” he said. Johnson said Pinckney’s death will be a huge loss for the legislature, noting that he worked well with members of both parties and he knew how to bridge the gap between them. “He’s one of those guys that everything he said made sense…You don’t find people like that just every day,” Johnson said. Johnson said Pinckney genuinely cared about other people, and particularly about those in the state’s rural and small communities. “He was the kind of person we need more of,” Johnson said. Pinckney’s cousin, political commentator Armstrong Williams, called him a “peacemaker” in an interview with NewsChannel 8’s Bruce DePuyt Thursday. Williams said Pinckney ran for the state legislature because people in his congregation kept encouraging him to do it, and because he saw that not enough was being done by politicians about the issues that concerned his community. Pinckney was elected to the state House of Representatives in 1996 at age 23, and he was elected to the Senate in 2000. “And yet, life gone for no reason at all,” he added. (2) Cynthia Hurd, 54: According to the Charleston County Public Library, she was a 31-year employee who managed the John L. Dart Library for 21 years before heading the St. Andrews Regional Library. A statement said Hurd “dedicated her life to serving and improving the lives of others.” The system closed its 16 branches Thursday to honor Hurd and the others who died in the shooting. County officials also say the St. Andrews library will be named for Hurd. (3) The Rev. Sharonda Coleman-Singleton, 45: A pastor at Emanuel, she was also a speech therapist and high school girls track and field coach, both positions at Goose Creek High School, according to her LinkedIn page. Jimmy Huskey, the school’s principal, called her “a true professional … [who] cared about her students and was an advocate for them.” Her son, Chris Singleton, is a baseball player and student at Charleston Southern University. Coleman-Singleton also had two younger children, writes the Post and Courier. (4) Tywanza Sanders, 26: He was a 2014 graduate in business administration from Allen University in Columbia. Lady June Cole, the interim president of Allen University, described him as “a quiet, well-known student who was committed to his education.” Known as Ty, he had worked in sales at department stores such as Belk and Macy’s. (6) Susie Jackson, 87: Lance’s cousin, she was a longtime church member. (8) The Rev. Daniel Simmons, 74: Simmons survived the initial attack but then died in a hospital operating room. He had previously been a pastor at another church in the Charleston area. (9) Myra Thompson, 59: She was the wife of the Rev. Anthony Thompson, the vicar of Holy Trinity Reformed Episcopal Church in Charleston. Wonderful message. I’ve had the opportunity and privilege to know and work with many black men (not many women in engineering) all over our country and can say that all of them are just plain good folks. I hadn’t noticed that there were no riots or even demonstrations, nut of course if there were no really bad things happening, there would be no national notice – no news. I have both(?) of your books, the last one about the court martial was a good read, but a really ROTTEN SITUATION. Was he Merle’s grandson? People can live and work together, but prejudice and stupidity seem to hang on forever.